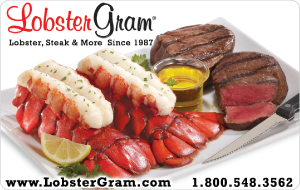 •	Since 1987 Lobster Gram has been delivering Live Maine lobsters and lobstertails, shrimp, chowders, melt in your mouth steaks, desserts, and more! •	A Lobster gram is a great gift and includes all the cooking instructions. •	A 100% Happiness Guarantee takes all the risk from ordering. •	Fresh. Fantastic. Unforgettable. From our shore to your door.